Faileld to copy file during export. 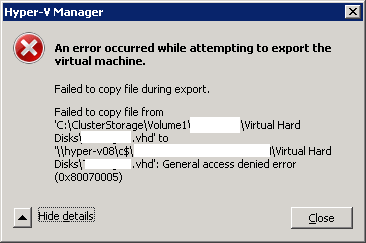 This error could also happen even you are not trying to export the file to network shared folder!!! 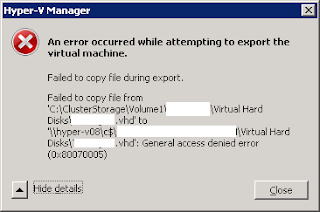 It can also happen if you rename the VM after installation, for example :(WINSERV1) to (WINSERV2) in this case if you try export the VM you get the same error. So you have to make sure that name of the server that you wont to exported have the same default name when the VM is created . or rename (.vhd) file to the new name. the 1st solution is better.